"On the whole, the most significant aspect of the government’s victory at this election is the message that it sends to the outside world that the vast majority of people in this country are backing the ruling party. This is all the more important at this time when people in countries where rights and freedoms are suppressed, revolt against dictatorial regimes. " 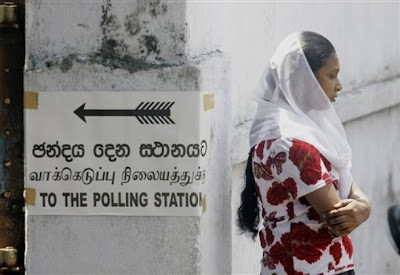 (March 30, Colombo, Sri Lanka Guardian) Comments and assessments on the first stage of local government elections concluded last week are many and varied. They vary from those inspired by party affiliations and prejudices to objective assessments by politically neutral persons. While ruling party enthusiasts gloat over their success, the vanquished opposition parties find solace in augmented vote banks. What is conspicuously absent is the custom in mature democracies of complimenting the victors. This absence is not without reason. The opposition parties cannot bring themselves to congratulating the victorious party because of the tainted nature of the way the election was conducted. The evidence of this blot on the escutcheon comes from the horse’s mouth. The Elections Commissioner Dayananda Dissanayake says that state resources and state owned media were misused both before and on the day of the elections. He also says that occurrences of thuggery were reported during the period of nominations and later, and that one marked feature of the election campaign was the competition even among candidates of the same party for preferences. “The manner in which some political parties and groups conducted themselves both before the date of the poll and on the day of the poll and also misuse of state resources and state owned media is regrettable,” he says. Is any further evidence necessary to show how scarred the conduct of the election was? The government party, no doubt, was at an advantage – mainly because the sound of victory over terrorism still reverberates around the country - and was destined to win the election in most local government areas. But the contemptible manner in which the election laws were violated took away much of the grandeur of ruling party victory that would otherwise have been theirs. While the government made use of all its propaganda to glamorize all the projects launched and completed and the programmes pursued in its much publicized effort to make Sri Lanka Asia’s wonder, the opposition harped mainly on the difficulties of the people caused by the high cost of living. They failed to expose in a convincing manner the weaknesses of the government. For instance, when the government politicians were crowing over the improvements made to highways and byways by carpeting and concreting them, the opposition failed to show with statistical data the deplorable condition that prevails in a large number of roads, and school buildings, housing schemes, hospital buildings that require immediate attention and remain untouched by the claimed development blitz. The prevailing corruption, profligacy, extravagance, waste and the parlous state of some government institutions and enterprises were not sufficiently exposed. Some sections in the opposition now blame the voters for not being sensitive to this issue of cost of living they persistently raised. What is obvious, however, is that although the voters were feeling the burden of high prices, yet they were not impressed that the opposition parties had any alternative plan or programme to bring down the prices of goods and services. Apparently, voters have not paid much attention to the charge of government’s alleged autocratic tendencies and suppression and curtailment of certain rights and freedoms. Although the government scored a resounding victory, it cannot be absolved from blame for calling these local government elections before enacting the new elections laws that were agreed upon by all parties and were ready for adoption by parliament. The ruling party obviously followed the policy of striking the iron when it was still hot. It knew that the victory it won over terrorism was still fresh in people’s memory although two years have elapsed after the event. Had the new laws been in place, most inter-party and intra-party conflicts that occurred could have been avoided and there would have been an improvement in the country’s political culture. Apart from these proposed laws, there were several other suggestions before the country for achieving the people’s aspiration of having really democratic, and free and fair elections and minimizing expenditure on these elections. Among these proposals was the one that advocated the holding of presidential, parliamentary and provincial council elections together to minimize expenditure and spare the people of the trials and tribulations they generally suffer at election times. There is urgent need for actively pursuing all these proposals by all parties and organisations that genuinely have the country’s interest at heart. It is only through appropriate and stringent laws that the behavior of political parties, politicians and supporters could be altered. It is, of course, axiomatic that the machinery for enforcing whatever laws enacted should be efficient, effective and corruption-free. On the whole, the most significant aspect of the government’s victory at this election is the message that it sends to the outside world that the vast majority of people in this country are backing the ruling party. This is all the more important at this time when people in countries where rights and freedoms are suppressed, revolt against dictatorial regimes. The duty of concerned and discerning sections of people, at this stage, should be to lend their assistance in building up this country as a true democracy avoiding thus the appellation of a fig-leaf democracy where elections are held to hide inroads into cherished democratic principles.